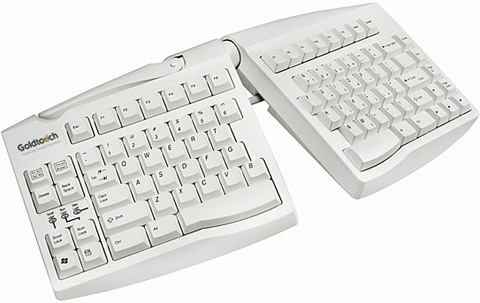 The Adjustable Ergonomic Keyboard allows you to adjust the two alphanumeric sections both horizontally and vertically to suit your individual body requirements. This helps you assume a more natural posture that is conducive to improving comfort and productivity while using your. “I think that the Goldtouch is a superior product compared to the Kinesis Maxim board because it promotes good keying technique of not resting the palms, the adjustability and manipulation of the angle of the board is easy to figure out, it follows good human factors design principles due to the "one lever" option therefore facilitating the ease to customize the fit to the user's stature and needs”. “The Goldtouch affords greater range of motion for hand and wrist positions encouraging neutral wrist postures with keying tasks".